If you know me, you will know that I like challenges. Life would be too boring if you were not setting up challenges or boundaries to cross. As I was shopping for my ingredients for my Mexican Dinner, I decided that I could make my own tacos and tacos seasonings. Ingredients for 8 tortillas: 6 oz of flour ( I used whole wheat flour), 1 tsp of salt, 1/2 cup of water. In a bowl, mix the flour and the salt, and slowly add the water and mix well. Out of the dough, make a ball that you will cut in 8 pieces. Roll each little balls out, and with a rolling-pin, flatten the ball to make a disk of about 9 inches. Repeat the process for each ball of dough. Turn up the heat on your stove to medium/ high and cook your tortilla in a frying pan for 1 minute on each side. Do not use grease or fat!!!! Set aside. Of course you can decide to buy the tortillas instead which is much quicker. 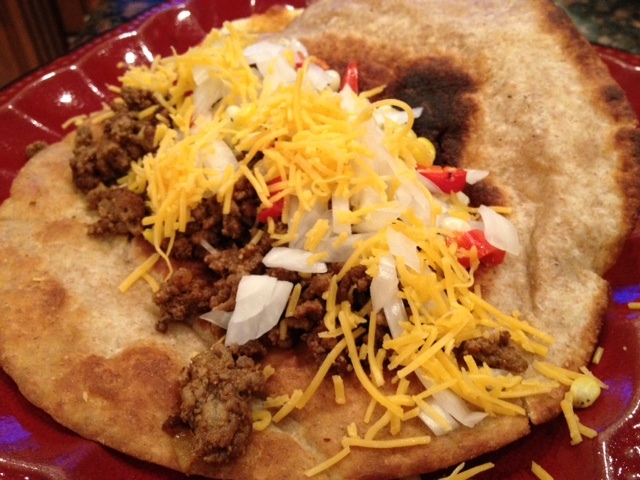 To make the tacos you will need 1/2 cup of olive oil, and the tortillas ( 1-2 per person). In a large frying pan, warm up 1/4 cup of olive oil. Place one tortilla at a time and fry it one side for 1 minutes until it becomes golden, with a fork, or with tongs, turn the tortilla and fry it for 1-2 minutes as well. 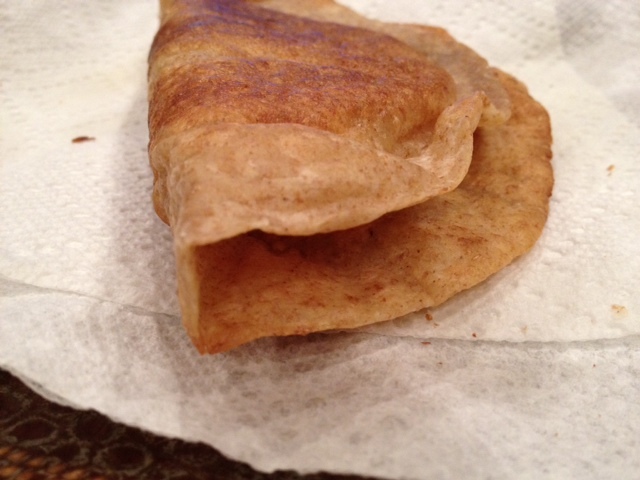 With a fork, fold the tortilla in half and hold it so that the tortilla will assume the shape of a taco. With a tong, remove the tortilla from the frying pan and rest it on a plate that you would have previously layer with paper towel. ( The towel will absorb some of the oil). 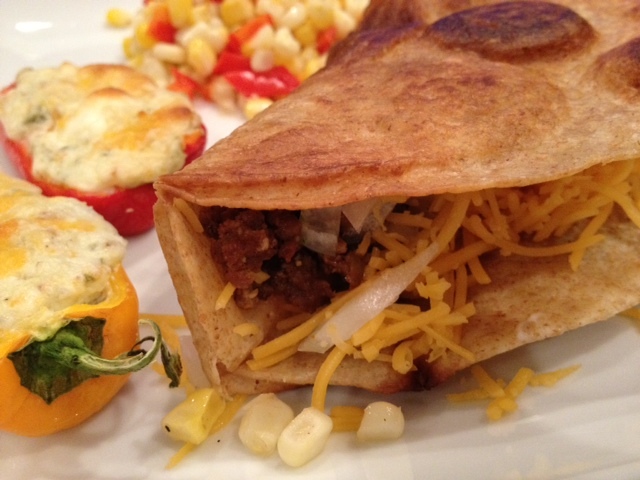 Set aside until you have fixed the rest of the taco fillings. The Meat Filling: 1 lb of ground beef ( I used ground sirloin), 1 tsp of dehydrated garlic powder, 2 tsp of paprika, 1 tsp of hot chili pepper, 1/8 tsp of salt, 1 tsp of butter, 1 tsp of flour, 1/4 cup of water., sour cream, 1 cup of cheddar cheese, 1/2 white onion chopped thinly, a few sweet red pepper chopped. In a frying pan, melt 1 tsp of butter and when it starts to sizzle, throw in the ground beef. Cook the ground beef until it turns to a brown color. Add all the seasonings mentioned above ( garlic, chili pepper, salt, paprika) and stir well. Add the flour and the water and mix well. Turn the heat to high and bring to boil. Lower the temperature and cook for a few minutes. Season with salt and pepper if necessary. 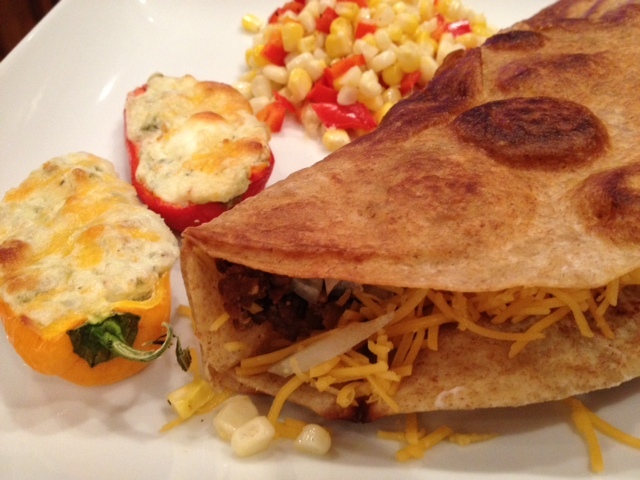 ground beef, sour cream, chopped onions, chopped red pepper, cheddar cheese. Corn is so cheap right now that it would be a folly not to buy it. And yes, you guessed it I bought 10 ears of corn so now I need to find creative ways to eat all this yummy corn. 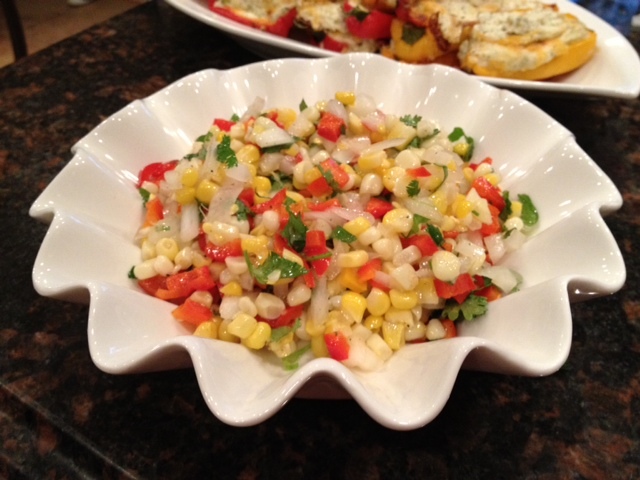 Tonite I wanted to use the corn as a side and decided to use what i had on hand to make a corn salsa. 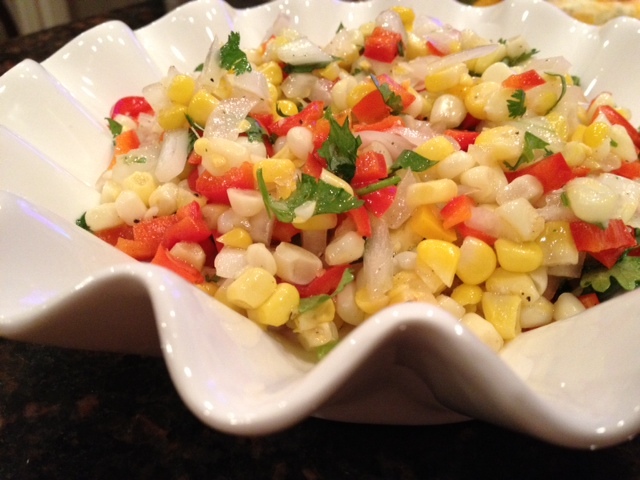 You may eat this salsa as a side, or as an appetizer. 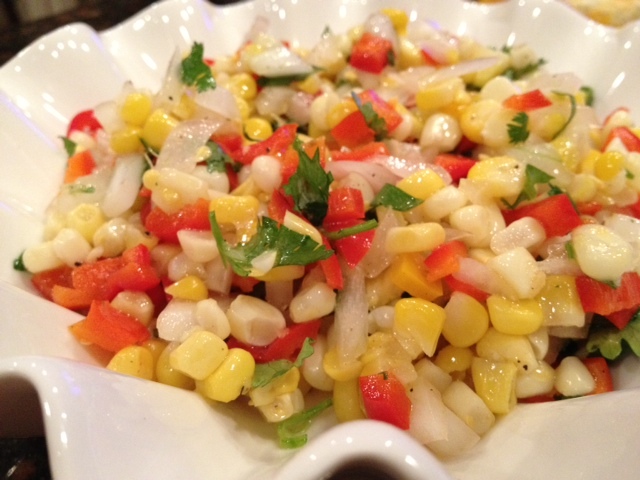 Ingredients for 4-6: 3 ears of corn, 1 cup of diced red and orange peppers, 2 tbsp of olive oil, 4 tbsp. of white vinegar, 1/4 tsp of salt, 1/8 tsp of pepper, 1 tbsp of fresh and chopped cilantro, 1/4 cup of white onion chopped very thinly, and optional hot sauce. Place the corn in the large round mold and cook them for 5 minutes. With a knife, remove the kernels off the cobb. Add the diced onion, the diced red pepper, the cilantro and all the other ingredients. Add a few drop of the hot sauce if you wish to spice it up. Et voila!! !